Home of the Quechan (pronounced Kwuh-tsan) Indians, Fort Yuma-Quechan Reservation is located along both sides of the Colorado River near Yuma, Arizona. The reservation borders the states of Arizona, California, Baja California and Mexico. Encompassing 45,000 acres, the reservation is bisected on the south by Interstate 8 (I-8). Consequently, several million cars a year drive through the Fort Yuma-Quechan Reservation on their way to and from Phoenix and San Diego. The Yuma, who today prefer to be called the Quechan, have long been known as fighters. For centuries they battled the Papago, Apache, and other tribes for control of the fertile flood plains of the Colorado River (created by Kumastamxo by tracing a course through the desert with the tip of his lance) which is the boundary between California and Arizona. Largely an agriculture community, the Tribe leases its 700 acre farm to a non-Indian farmer. It also operates a long-term sand and gravel lease with a non-Indian corporation which employs 8 to 10 tribal members. 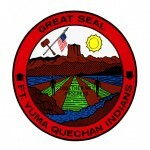 In addition to farming and the sand and gravel operation, the Fort Yuma Quechan Reservation counts on tourism and related business to augment its economy. The hot summers and relatively warm winter temperatures make the site a desirable winter vacation spot from November to March. To serve this audience the Tribe manages five trailer and RV parks, a small grocery store, museum, bingo hall, utility company and a fish and game department. According to the most recent data from the Tribal Enrollment Office, the Quechan population totals 2,475 members. The Quechan Tribe has received a grant to build a Heritage Center to be located on I-8. When complete it will feature a museum and a hotel. Groundbreaking is scheduled for 1995. Other visitor attractions include the nearby California dunes and Yuma’s historic areas, golf courses, night sports, and shopping at San Luis, a port-of-entry community. Water sports such as fishing, water skiing and swimming at lakes along the Colorado River are also available. In 1994, the Quechan Tribe opened a 300 seat bingo hall. Recently the Tribe entered into an agreement with Pacific Coast from Minnesota to develop a new casino. Contact the Tribe for local community events.